PLCopen is working on a document showing a PackML submodel example for the I4.0 Asset Administration Shell technologies. A proposed PackML sub model can be viewed as a machine behavior semantic model. A REAL CHALLENGE TO DIGITAL REVOLUTION is the convergence of IT (Information technology) and OT (operation technologies). This means that IT, or more precisely the ICTs (Information Communication Technologies), will link the altostratus levels of Watson, Amazon, SAP, and the likes, directly to the automated production shop floor. A new concept for production machines is being defined as Asset Administration Shell. Some may say that innovation technologies will meet the old technologies. Backward compatibility, product consistency and reliability requirements can force many automation technology vendors in a conservative attitude in regards to IT. On the other hand, what is the ITC provider′s know-how and background on manufacturing, industrial robotics and factory automation? It is easy to say that a cloud to sensor connection will change the production world, but that might be oversimplifying the engineering skill-set required. Solid bridges must be tended between the two technology worlds. One important new concept for production machines in the digital era is being defined as the AAS, Asset Administration Shell. In the future every asset, machine or high-value component will need to be equipped with an AAS to be "I.4.0 ready". In case of a machine the AAS, as seen from the cloud should be the main landing page or resource directory listing all services the machine can provide as well as all relevant asset information. In that case traditional but reliable automation practices need to be incorporated into the AAS. Field proven information models for production automation can be proposed as sub models. 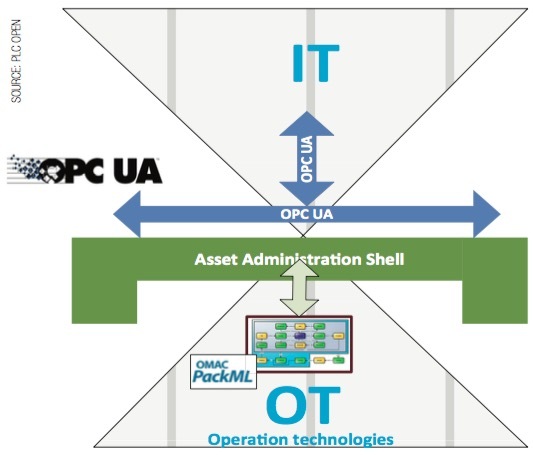 One of these models is PackML, which defines the machine operation, a uniform operator Human Machine Interfacing, and provides predefined Overall Equipment Efficiency KPIs. A PackML sub model can be proposed as part of the Administration Shell as a machine behavior semantic model. As a proposal of such a sub model PLCopen is working on a paper with the intent to motivate the different stakeholders to consider such an effort. New concepts like AAS combined with automation information models can help bring the IT and OT together, by providing an ample landing bridge.